We offer CAD conversion services that can convert your hardcopy drawings into electronic format of CAD drawings. This would make archiving, retrieving, copying, editing and sharing of the drawings easier. We have expertise in Paper to CAD Conversion, Raster to CAD Conversion, 2d to 3d drawing conversion services using SolidWorks and AutoCAD. We are proud to be one of the few CAD companies in the world which are able to produce very accurate CAD drawings in 2D and 3D format for military and aircraft industry. We partner with mechanical engineering firms to transform conceptual designs to manufacturing ready 2D and 3D CAD drawings. 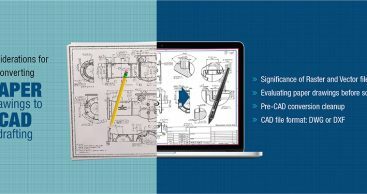 With an industry experience, our mechanical drafting team can convert any paper plan, PDF, and images such as TIF, JPG, GIF, BMP, and PNG to CAD readable and accurate multilayered electronic file formats such as DWG, DXF, DGN, MCD. We also offer services for existing legacy design data migration to new CAD platforms, to provide better returns on new CAD technology investment. To ensure accuracy in conversion process, we follow multiple quality checking processes, thereby reducing responsibilities from client’s end.